Host meetings with a single tap – for free! 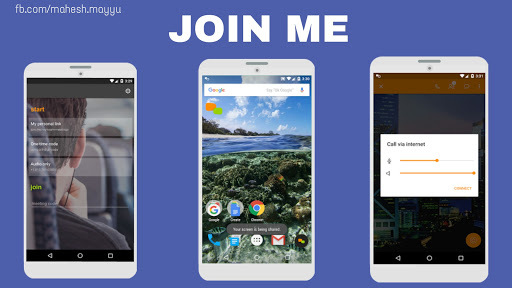 join.me lets you host and share your screen* and any of your apps. Just one tap starts a scheduled meeting, a spontaneous meeting, or a conference call. Join a meeting from anywhere. Just type in the meeting code and you’re instantly on the same page, even if you’re hundreds of miles away. When you’re ready to share your screen*, start your meeting and tap the orange button – this is your screen-sharing button! Now your attendees can see the screen of your Android phone or tablet. Open Docs, Sheets, Slides, websites, or whatever! Attendees can follow and see everything you do. Want to share the spotlight? Pass the presenter role off to another attendee from your phone or tablet. * Screen sharing is supported on Android 5.0 and higher. ** Roaming, data and other applicable operator or carrier charges/fees may apply. Optimized for Android 4.1 and higher. This entry was posted in Android and tagged Personalise, tools.